Cocktail Foodviva Boilermaker Drink – Are You Brave Enough For This Whiskey Shooter? There are very few shooters which use whiskey, but those few pack a quite a lot of punch. One among them is boilermaker drink. It is a combination of whiskey and beer and can be drunk in multiple ways. Continue reading below to find out three different ways of enjoying this amazing, quickly intoxicating cocktail. There are three different ways of enjoying it. Serve whiskey in shooter glass and beer in a glass. First drink whiskey in single gulp and then drink beer at leisure. 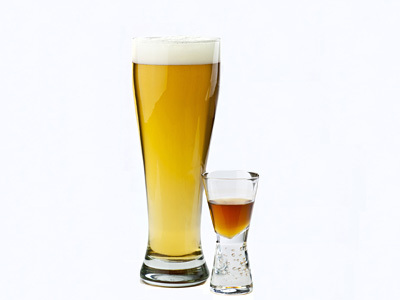 Mix whiskey and beer in a glass and serve. Drink as quickly as possible. Pour beer in a glass, position two chopsticks in parallel on top, carefully place whiskey filled shooter glass on it. Give a hard thump on table and let whiskey fall in beer (as in bomb shot or depth charge). Optionally stir and drink in single go.